This is the not the first version I wrote of my review. The first version was a whole lot of fan girl spoiler action. I can't have any of the spoiler business on my blog so after getting it all out of my system, I scratched it and started anew. I tried explaining what this book is about to my husband, and I bumbled through it rather incoherently. I'm not going to try to recreate that here. I will point you to the book description ^ to learn what The Rithmatist is about. So, yeah. Basically these kids draw shapes with chalk to defend themselves against chalk creatures who can and will try to kill them. It's kind of a nerdy book with the math and the unicorns, and I seriously loved it. I love when a book's excitement builds and builds for me. I was hooked early on because I like nerdy things, and I really liked Joel's character. Then students started disappearing and we started getting to know Melody and all of the teachers including that one new teacher you just know you can't trust. Joel and Melody are trying to figure out who has been taking the kids, and a lot of awesome that I won't spoil ensues. I was so hooked to the story I was practically fist pumping for Joel and Melody in the end. And the bad guy... I'm so excited about the bad guy, and I can't wait for the rest of this series. I mentioned the other day how frustrated I am that series books never give me a whole story anymore, but The Rithmatist gave me a complete story and a big dose of excitement over what's to come. This is my first Brandon Sanderson book so I had no expectations going in, and I have no reference or comparison to his adult books. My library has two of his other series so I will be checking them out eventually. If the book description sounds good to you, you should definitely read the book. The only comparison I have is it reminds me of Harry Potter. That's dangerous territory, I know, so take it how you will. As for me, I cannot wait to read the next book. I listened to The Rithmatist on audio. The audiobook was narrated by Michael Kramer. I agree how sometimes series books just string you along without making the book stand on it's own legs. Yes it was so nerdy - I really enjoyed it too! You will LOVE his adult stuff! He is one of my favorite authors! I highly recommend The Emperor's Soul - its a novella but so excellent! He said it was his favorite work to date - well at the time it was released anyway haha. Haha. I love it. I was hoping I wouldn't offend anyone by saying it was nerdy, but it was. :) Thanks so much for the The Emperor's Soul recommendation! I can't wait to read some of his adult stuff. I am completely on board with this! This sounds good, and I'm okay with the HP comparison. I don't read a whole lot of middle grade, but when I do it tends to be fantasy like this. I tagged this as middle grade and young adult, but it's technically supposed to be a young adult book. I think it works well as a middle grade, though. An interesting magic system based on drawings and geometry, set in an alternate universe United States. 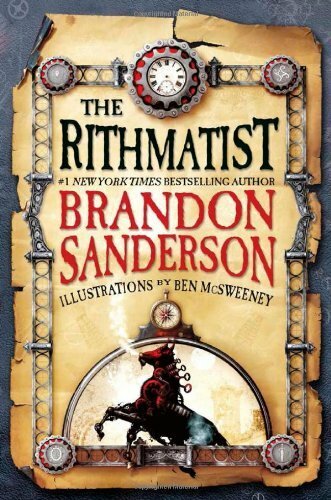 This looks like it will be the start of another great series from Brandon Sanderson. Definitely aimed at a younger audience, but as with Harry Potter, it is great for all ages.